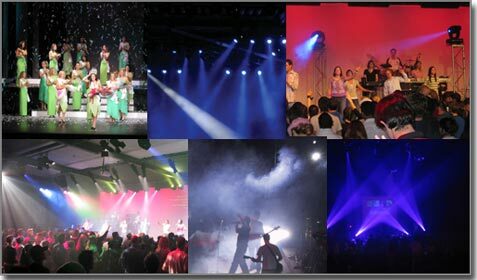 To create dynamic and inspiring concerts you need a lighting controller that works as you do. While some concerts are fully preset by the time they start, others require dynamic and on-the-fly control. LightFactory gives you the best of all worlds with flexible cue lists and virtually unlimited effects and scene playbacks. Running the show could never be simpler using the powerful shortcut system for instant access to any function in the software. Shortcuts are accessed form either a touch screen or any number of low cost external hardware devices. Unlimited cue lists allows every song or item to have its own set of cues. Playback up to 150 cue lists at once. An unlimited number of independent effects can be played at the same time. Fast access to effect playback through customizable effect runner screen. Add unlimited effects into cues. 5 Different effects engines allow you to use the most appropriate effect for the job. Advanced shortcut system provides instant access to any anything (palettes, cues, fxs etc). Generic palettes can be applied to any fixture and type. Advanced palettes are fixture specific for position presets and scenes. Up to 10,000 submasters that can be assigned to any combination of attributes. Built in LED array effects system. "LightFactory's versatility and accuracy undoubtedly allowed us to include more complex looks and effects as we were able to perfect these before the get-in. The Channel groups facility enables you quickly create looks using stock groups but more importantly, you can trim for different venues without having to re-write. The ability to edit live cue lists quickly during the limited rehearsal time available meant that fine adjustments to the lighting balance could be made without re-running numbers."